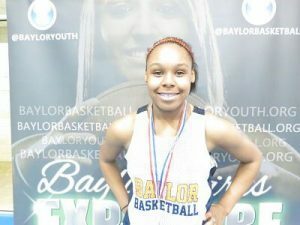 Baylor Youth’s Kyisha Hunt is the first to commit for the 2014 season to University of Illinois Chicago better know as UIC. Kyisha is not only a athletic player on the basketball court. She dominates in volleyball, too. Kyisha turned down several Division I basketball offers to follow her passion of volleyball. In the efforts of not letting down Mrs. Baylor, she decided to walk on the basketball court at UIC. Head Coach Regina Miller from Illinois University Chicago got a chance to witness Kyisha talent at the Miller’s Elite Basketball Girls Camp this fall. Kyisha is truly a high academic achiever with maintaining over a 3.7 grade point average and is in honor classes. She plays school volleyball, track and the Pep Club. She is a true role model to her peers. Kyisha Hunt obtained a full athletic scholarship along with receiving two additional years for pre-med course work. WOW!!! Kyisha will be studying to be a Pediatrician at UIC. She is truly a dedicated, hardworking and a very intelligent young lady that definitely will represent Baylor Youth in a positive manner. We are so proud of Kyisha and wish her much success on her new journey! We know that we will be reading about more positive accolades in the near future regarding our Kyisha.